In Disney's Year Book 1996, the short story "The Surprise Party" establishes Elisa's birthday as being on New Year's Eve. 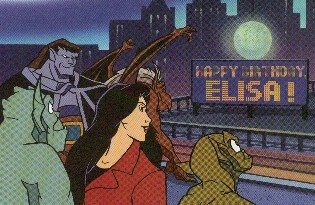 In "Meet the Gargoyles," Elisa's age in 1994 is listed as 25. Which means she would turn 26 on New Year's Eve of that year. Which means she was born on December 31, 1968. Which means that everyone's favorite detective will reach the big 3-0 on December 31st, 1998!